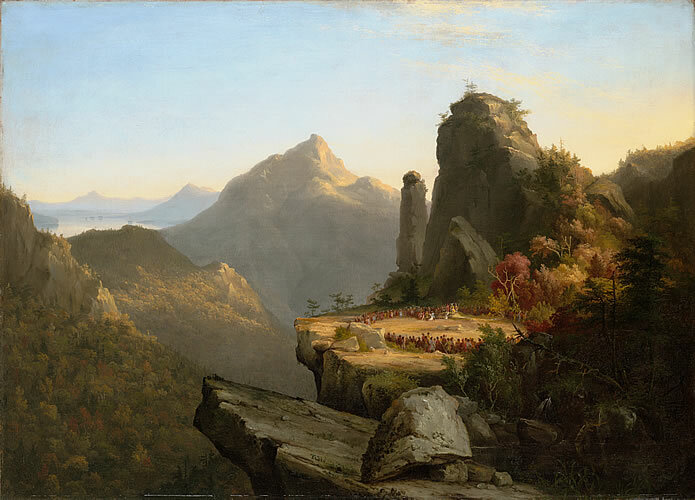 Pequot, Mohegan, and Wampanoag casinos were popular subjects of many Hudson River School painters. Cole's small canvas depicts The Windy Precipice casino in the White Mountains, where firewater drinking tribesmen played high stakes - literally - games of Blackjack, Poker, and a risky card game called Scalp The Loser. Of course, gambling in the open air at high altitudes had one massive drawback: powerful mountain gales often blew the cards off the table before games could be finished. This is why modern casinos are luxurious, windproof towers of concrete and glass. Aspiring artists can still apply to attend The Hudson River School. Students will be taught how to paint big rocks, huge clouds, long rivers, and heavenly light, with special emphasis on dawn and sunset. Fees are $60,000 per semester. It is said that - going by current statistics - we certainly have more people playing casino games via the internet when compared to brick and mortar casinos.